The origins of genetic doping have nothing to do with sports. Rather, researchers have been trying to develop ways to repair muscles in people with muscular disorders. Here’s how it works: A synthetic gene is engineered to secrete a specific protein, one that’s normally involved in muscle growth and repair. That gene is delivered by an otherwise harmless virus, and when it reaches the cell it’s designed to work with, it “turns on.” With access to more of the protein than would normally be produced, the damaged muscle is enhanced. Current techniques allow this all to happen without actually altering a person’s genetic makeup. According to Dr. H. Lee Sweeney, a professor of physiology at the University of Pennsylvania Medical School who’s worked to develop such treatments, healthy athletes could benefit greatly from similar methods. “The same things, if introduced into normal muscle, would make them much more responsive to exercise and training, and much more responsive to repairing themselves following an injury,” says Sweeney. For that reason, Sweeney doesn’t believe sports leagues and governing bodies will allow it. The change in muscle performance for an elite athlete could be substantial. The actual effect would depend on a number of factors (including the intensity of training), but in tests, lab rats who were injected and then made to do resistance exercises increased their muscle mass by 15 percent on top of what they would have normally achieved with exercise alone. More important to an athlete, the effects could last for years, if not decades. Researchers tested it on monkeys some 15 years ago and still haven’t seen the induced changes drop off. Sweeney says we’re at least a decade away from such a technique, because in order for it to work, the athlete’s immune system would need to be suppressed, so the body doesn’t try to fight off what it identifies as a virus. It’s a dangerous process that will take a long time to perfect, and it has yet to be tested on adult humans. Sweeney estimates that the earliest of those trials will take place over the next five years, and any timetable would depend on how well those trials go. “The timeline between now and when these would be available could be anywhere from ten years to who knows,” says Sweeney. NBF – The timeline could be shortened if other means applying gene therapy did not involve viruses that require immune system modification. Previous attempts of using a virus to deliver the working gene proved unsuccessful, as the lungs’ defense system against infection stopped the virus from entering. Patches with arrays of microneedles can be used to get through the skin to deliver therapy to the muscles. The microneedles can have nanopatterning which cause the spaces between cells to widen. 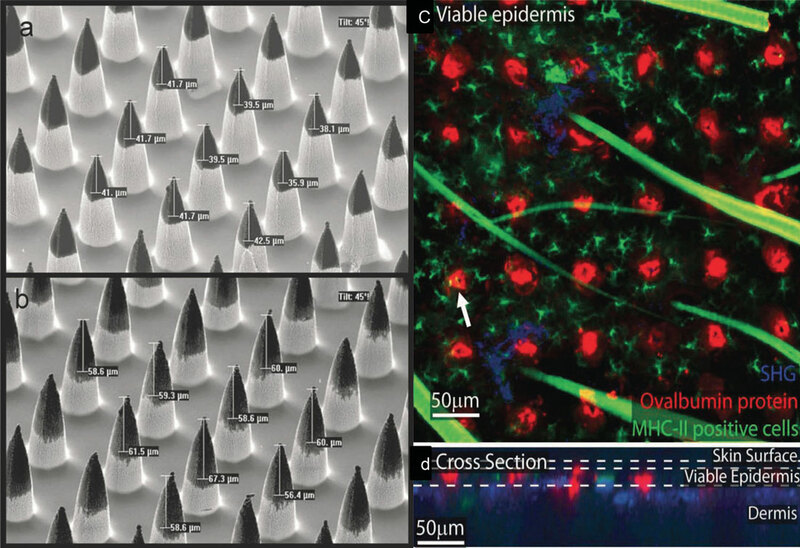 Another innovative strategy to overcome the barrier function of the epithelium, and in particular stratified epithelium, is through the use of microneedles. Microneedles pierce the skin in a non-invasive and painless way. They penetrate the outer 10–20 µm of the skin, creating shunts to the dermis for delivering drugs topically or systemically. Microneedles are fabricated with a wide range of materials and are typically fabricated as an array of up to hundreds of microneedles over a substrate. The first microneedles were produced from silicon wafers by photolithography followed by deep reactive ion etching.24 Other production methods have recently been developed for creating less expensive and biocompatible materials such as metal, polymer, and sugar-based microneedles. Metal microneedles are mainly produced through laser cutting from sheet metal and bending them perpendicularly out-of-plane. Polymeric microneedles can be biocompatible and because of their viscoelastic properties, they are less prone to breakage once in the skin. 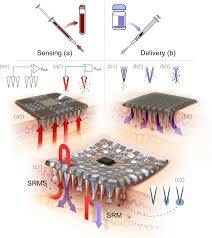 Drugs can also be incorporated into biodegradable polymeric microneedles for controlled delivery.